If you are looking to add a dose of elegance to your home, than custom made glass kitchen countertops will certainly add that beautiful, eye-catching, and unique design aspect that you have been searching for. Although Granite has been the standard high-end kitchen countertop of choice for years, other quality materials are beginning to push this dinosaur into the background. Glass is definitely leading the charge based on its distinctiveness, durability, and flexibility of design. In fact many clients relate their glass kitchen countertops to a piece of fine art with the added benefit of being extremely functional. see a color palette chock full of a mix of blues, browns, greens amongst many other colors. They tend to introduce your kitchen to a combination of the brightest and lightest surfaces available on market today. 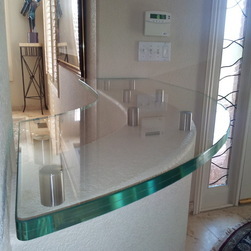 Glass countertops are stain resistant and extremely durable. Many people are surprised by this revelation based on their experiences with the fragile nature of other glass objects such as mirrors. In fact, glass countertops are sturdier, and even easier to maintain than their granite counterparts. Speaking of granite, according to the National Kitchen and Bath Association the costs are relatively the same. It is not like you need to break the bank when you make the choice to install glass. If the glass countertops are colored or translucent, textured or smooth, they may be easily combined with other materials in order to make an even more unique design. For example, glass is the only countertop material where LCD lighting can be installed beneath the counter in order to provide a backlit ambiance. This feature adds an entirely different look and feel to the room. Of course the lighting enables the countertop to change colors and or brightness whenever it suits you. Imagine having the ability to change an opaque clear look into whichever color you want, whenever you chose to by simply flipping a switch or changing a light bulb. In addition, homeowners greatly appreciate the fact that they will never tire of the permanent material because they have the ability to constantly change the look with absolute zero effort or additional costs. Now imagine if you were able to do that with your wall colors, or flooring. This aspect provides an added artistic, and customized touch to the material that you simply cannot achieve with granite. Accents of aqua, turquoise, and various other shades of blue are popular choices these days. Glass countertops are available in a variety of thick nesses, with a range of 3/8-inch to 1/2-inch being the most popular for daily kitchen use. They are typically constructed out of annealed or tempered low iron clear glass based on the durability and safety aspects that this type of material provides. Homeowners often decide to include a polished edge in order to further enhance the natural materials. Unlike natural stone, custom glass countertops have the ability to be designed without unsightly seams. A Cut Above Glass is the leading designer and installer of glass in Scottsdale, Arizona and surrounding areas. Please contact us today for an initial consultation regarding glass kitchen countertops or any other of your glass related needs.